Synopsis: The point of departure for Tarpaulins was a colorful disturbance on the cityscape of Los Angeles: a home in the distance festooned with a giant striped tarp. These are termite fumigation tents and filmmaker Lisa Truttmann follows their story on a two-year long investigation as she hunts down the tents, the homes, the termites inside and their traces. As the film goes on, the termites soon become our allies, guiding us through Los Angeles’ neighborhoods on their own terms. Questions of life and death, profit and loss, home and un-home, macrocosm and microcosm are brought to the fore in pursuit of the city's tiniest inhabitants and their exterminators. The tents become temporary sculptures, beasts heaving in the wind, skeletons dressed and stripped by workers we see. Wooden structures, soon to be homes, become eroded landscapes after an attack. And there, underneath the colorful mantle and its function, Truttmann elicits revelations of the uncanny. In a constant dialogue we hear the voices of workers, exterminators, entomologists, chemists, city planners, fellow travellers and literary authors. Contemplation is thrown into a zig-zag while an alter ego questions its own ideas and their making. Little by little the visual, political, social and economic relations of humans and nature unfold, anchored in a personal itinerary that is the framework for everything else to follow. As an essay film, Tarpaulins is a subjective view on a place and a circuitous conversation, embracing “unkempt activity”, restless labor, meandering thoughts and obsessive wanderings. Artist Bio: Lisa Truttmann, born in 1983 in St.Pölten, Austria, is an artist and filmmaker based in Vienna. In her work she weaves documentary elements into staged settings and essayistic montages, tracing the structures of social, urban and natural landscapes. She studied Transmedia Arts at the University of Applied Arts in Vienna and received a Fulbright scholarship for her graduate studies in Film/Video at California Institute of the Arts. 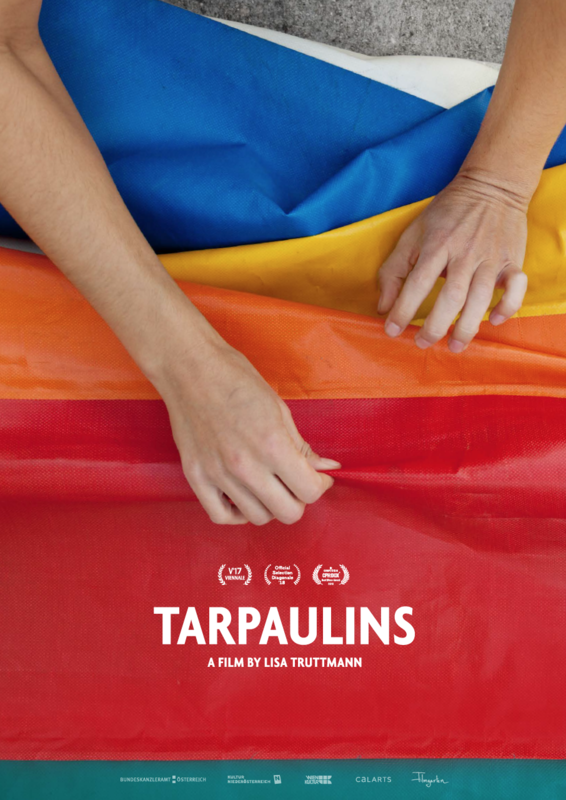 Tarpaulins is her final project and first feature length essay film. Truttmann’s moving images and installations have been shown at exhibition venues and film festivals such as CPH:DOX, Viennale, New York FF Projections, IF Toronto, Jihlava IDFF, Ann Arbor FF, Alianza Francesa Buenos Aires, MAK Vienna, and Kunsthalle Project Space, i.a. Since 2017 she teaches at the University of Art and Design Linz and University of Applied Arts Vienna, since 2018 she is a member of the Golden Pixel Cooperative.